BEIJING - Though wrinkles have spread all over 96-year-old Isabel Crook's face, she does not have much time to enjoy the leisurely days of a retiree like most of her Chinese contemporaries. Instead, she is working on a new book. The elegant lady, who is also a committed communist, has spent quite a while on her new book, which describes the life of the people in a village in Bishan county during the War of Resistance against Japanese Aggression, the Kuomintang government's attempts at reform, and analyzes the changes that took place. "I hope the book can supplement previous studies to record the transformation of China's countryside," she told China Daily in an exclusive interview. Born to a Canadian missionary family in Chengdu, Southwest China's Sichuan province, in 1915, Isabel Crook has spent more than 73 sometimes turbulent years in China. Following the completion of her BA, she completed a master's degree in child psychology at the University of Toronto. In 1938, Crook returned to China where she was one of the first Western women to engage in anthropological fieldwork. The most important case study, which she called "the turning point of my life", was conducted in 1940 at a town called Xinglongchang - now named Daxing - in Southwest China's Bishan county. 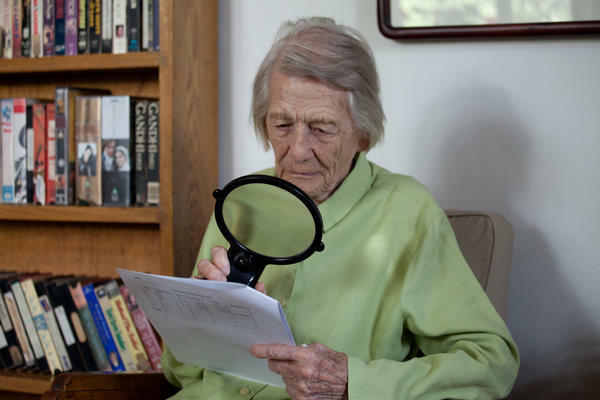 Her job there was to conduct both survey and social work, aiming to relieve local farmers from extreme poverty. After staying in Xinglongchang for one year, Crook finished a door-to-door survey of 1,500 households. During that period, the young Canadian anthropologist was often shocked at the miserable lives of local peasants, who were unable to avoid misfortune, especially those arising from natural disasters as well as oppressive authorities. "It was then I first came to realize revolution was needed for the poor farmers," Crook said. At that point, she met David Crook, a faithful member of the then Communist Party of Great Britain, who later became her lifetime partner and turned her into a steadfast believer in communism. "David alleged violent revolution was necessary. He finally convinced me by saying if you had a very serious acute illness, that could be cured with an operation, would you not have an operation rather than go on suffering?" In 1942, the two returned to England and got married there. At the end of World War II, Crook began doctoral studies in anthropology at the London School of Economics. The Crooks returned to China in 1947 to observe and write about land reform. With an introduction from the Communist Party of Great Britain, the couple was able to settle in Shilidian (Ten Mile Inn) - a village in the communist-controlled border region in North China. Based on their experiences there in the following eight months, the Crooks wrote a sociological work, Ten Mile Inn - Revolution in a Chinese Village (London, 1959), a detailed account of land reform under the Communist Party of China. Even today, Crook said, land reform in rural China still has reference value for poor countries. The sense of connection with rural China and the commitment to building a bright communist world encouraged the Crooks to stay in China after the founding of the People's Republic of China in 1949. They began to teach and groom China's future diplomats with English language training at what is now known as the Beijing Foreign Studies University. Although devoting their lives to the newborn country, the two were still not able to remain safe from the turmoil caused by the "cultural revolution" (1966-76). Branded as foreign spies, Isabel and her husband were jailed for several years. Even so, "David and I did not blame the country because of the political chaos in that special era", Crook said. After the "cultural revolution", the couple returned to the Beijing Foreign Studies University and again resumed busy teaching careers. However, Isabel Crook never dropped her longstanding interest in rural reform and continued to pay visits to Shilidian and Bishan county to witness and record changes in people's lives in rural areas. "With the Party and the government's ongoing drive to provide the whole country with modern roads, telephones, e-mail and such infrastructure, rural people will not be cut off from the towns and cities," she said. As an "old friend of the Chinese people and the Communist Party of China", Crook is among a handful of distinguished foreign experts who are invited to attend an annual reception with the Chinese premier, and she has even used these occasions to share her thoughts on how to improve conditions for rural people. "The government has invested heavily in much-needed material infrastructure, roads, railways, and energy," Crook told Premier Wen Jiabao at the annual meeting on Feb 10 last year. "Now an equivalent amount is needed for social infrastructure, such as setting up community centers to meet the social needs of rural family and providing educational opportunities to enable rural people to master the skills and gain the recognition they deserve," she suggested. Although David Crook passed away more than 10 years ago, Isabel said she often recalled the days they spent together working for the well-being of the Chinese people. And she still remembers the spring of 1949 when she first came to Beijing to celebrate the peaceful liberation of the city by the communists. In June that year, she recalled, on the eve of the Communist Party of China's 28th birthday, Chairman Mao delivered a speech, claiming "the victory is just the first step of a long march of 10,000 miles" and "building socialism will take a long time". "David and I both thought Chairman Mao was too modest in saying that. 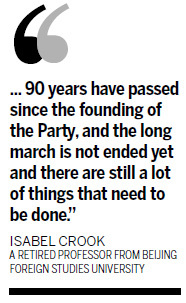 But now I see he is right - 90 years have passed since the founding of the Party, and the long march is not ended yet and there are still a lot of things that need to be done," she said.